Broken Link Building Guide – How to get 250+ Links in a couple of hours work…. OH MY! So chicka chicka check this…. I’m gonna show you how to get 50 links per month, for absolutely any website in the entire world. These links will be both extremely relevant to your subject area as well as being authoritative…. OH MY! You think that will help out your referral traffic? erm… yah it will. You think your organic rankings will rise each and every month? erm…. YAH!!!!! Anyone who wants more traffic or better rankings to a website for either a client or for yourself. Using broken link building, this has always been and still is one of my favourite techniques of building links. Mainly because it is easy to teach to somebody else, so long as they have the time to go through the steps, which means I can remove myself from it as much as possible. It’s not absolutely necessary, however if you want to really speed things up I’d take a look at Citation Labs Broken Link Builder, it’s an incredible tool. I also use Buzzstream (or Ninja outreach) to send my outreach emails, but you already have that from my previous articles don’t you? The first thing you need to know about broken link building is that it isn’t predictable, you will unlikely be able to have a piece of content already and be able to find broken links that match that. Replacement content – this is when you find a piece of content that is no longer online, so you recreate something extremely similar to get direct replacement links as your content now serves the same purpose as the previous, broken content. Suggested replacement – you tell a site owner that they have a broken link and that you have a replacement piece of content that they may want to replace it with. The difference between these is how scaleable it is, option 1 relies on finding opportunities, publishing new content quickly and then approaching the people who linked to the old content to replace it with yours. Option 2 you can use a single piece of content and approach a lot sites that used to link to similar types over and over again as you are only suggesting something “of interest” not a direct replacement. Option 1, will get you a better conversion rate on your outreach but you will need to create more specific content. Option 2, will get you less links and a lower conversion rate, but you have to create less content and can even use your existing content. I almost always choose “create keyword campaign” as it provides me better and more results. You will now need to choose some keywords to use, depending on how many credits you bought you will have to be careful as each keyword you use, uses 1 credit. I tend to choose 2 or 3 at most for each campaign. Here’s a great way to find keywords – USE DMOZ! Let’s say for this example we are building links to a site about wedding photography. 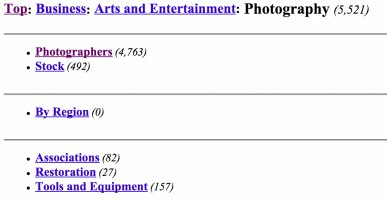 So we go to DMOZ and type “photography” into the search box. It may seem counter intuitive to leave out the thing that makes our site stand out from other photography sites. You can get easily lost doing this so try to limit yourself to about 10 minutes on DMOZ, from these 2 pages I have found I have found a few keywords that I think might be workable, which means that I can create content around that and it won’t look out of place on the clients site. I am obviously super duper happy about these scores, it means that I will have literally hundreds of pages that are dead, that probably have hundred of links each linking to a broken resource. Time for me to be their hero and offer them a replacement piece of content and save the day. Aren’t I sweet? and really selfless helping out in such a way. NOTE: If your results are below 100 (this is literally scraping the barrel, you need to take a step back and choose a more broad keyword to test. Now that you have some keywords that fit the criteria, it’s time to run the campaign and come up with some targets. The toll will come up with likely a couple of hundred pages that are dead. The pages will all be related to your subject area, but keep in mind that the relevancy score displayed on this page is based on your first keyword, not really sure why this happens like this but I guess it’s just part of the tool. From this page, I always open 2 consecutive pages, the first just by clicking the broken link URL, you will sometimes find a new page being displayed that is not the one we want to replace and for some odd reason, sometimes we just find the page we thought was broken. I then click on the small “file” looking symbol to the left of the results and open in a new tab, this shows me how the page used to look. 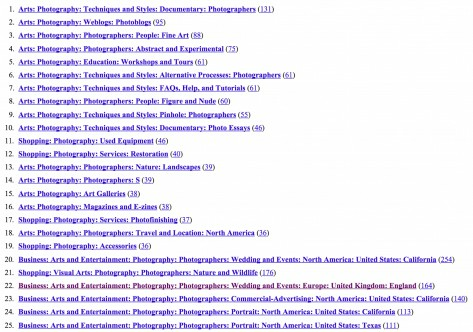 Look at the number of links, linking to these pages, all of those sites linking are pointing to a broken resource, if we are an adequate replacement for that top result for example, we could potentially get 2642 links. Now with the exact outreach methods I am using and providing below, I average around 10% successful link placement. That means that from just that one result I will probably receive 260+ links. In my book that is 5 months worth of links, and probably thousands of visitors through both referral traffic and rises in organic search rankings. Simply click on the export links and contacts button, this will give you a spreadsheet of all of the pages that link to the broken resource and some contact info if it can find it. You can find more info on how to do this in my other article by clicking here. Again, general outreach and follow up info is provided in my previous article, OVER HERE! Although specific outreach templates are included in the goodies at the bottom of this article for your lazy pleasure.